Bodegas Alceno is a traditional family-owned winery located in Jumilla, considered to be the first winery in the DO to market wines commercially. The winery has been in operation since 1870 and was the first commercial winery in Spain’s Jumilla region. 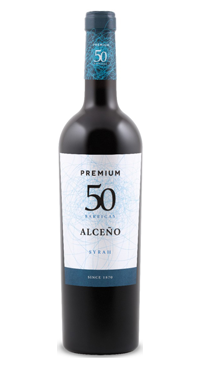 The 50 Barricas Syrah drinks well above its price point. This is a blend of 85% Syrah and 15% Monastrell aged in new and American oak barrels for a few months. The wine shows a nice balance of ripe fruit, spices and oak notes. Reminiscent of Syrah from the Rhone, the nose is fresh and bright with aromas of smoke, raspberry, and bacon fat. The palate is medium to full with great acidity and a touch of heat.